PA Hire | Party Pack 1 Sub. 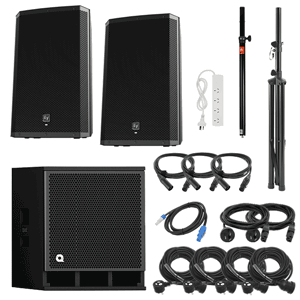 Plug this PA Hire pack into a DJ mixer or another source to deliver the right amount of range for larger sized events with up to 215 people. Need some extra 'zing'? This package will be perfect as the Quest QM subwoofer will pair with the two 1000w EV's to really get the crowd moving!